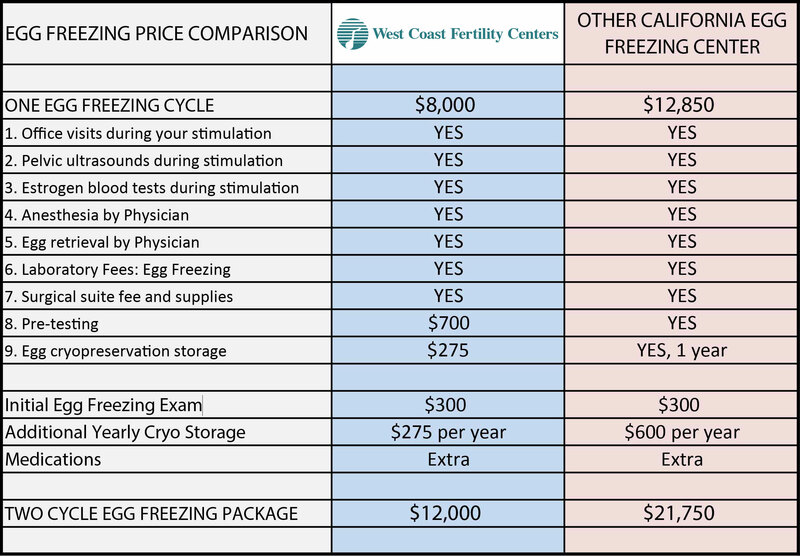 West Coast Fertility has been a pioneer in the science of egg freezing since the year 2000. Our egg freezing and thawing techniques have resulted in the births of over 200 babies. Our center has one of the largest experiences dedicated to the science of ovarian stimulation, egg harvesting, processing and expertly freezing eggs for long-term storage. Our goal is to safely harvest the greatest number of eggs without over-stimulating the ovaries. This means 6 – 20 eggs are harvested per freezing cycle depending on the woman’s age and general health. The larger the number of harvested eggs indicates more of them will be mature and fully expanded meaning a higher percentage will survive thawing, fertilization, and better pregnancy rates. Our goal is to have the strongest and most viable eggs since a minimum of 6 must be thawed per each attempt in order to yield 2 or 3 embryos for transplant to the uterus. Given our experience and success rates in egg freeze, we are able to offer our patients the most affordable price of $8,000 for one cycle compared to other facilities who can charge more than $10,000 per cycle. To introduce you to our services, our highly trained Egg Freezing Instructor meets with interested women for a Complimentary Information Session to review the basic steps when considering freezing your eggs. To schedule this free service please call 714-513-1399 to request your session. An initial meeting is needed with our physician who will perform a physical examination, a pelvic ultrasound, a review of necessary testing and formulation for the medication protocol along with a review of possible risks and complications of egg freezing. The cost for the examination is $300 U.S. Hormonal testing, metabolic panel, prenatal panel costs are about $700.00 U.S. The average cost of medications needed for egg growth and development vary widely and average from $2,500 – $5,000 depending on hormonal level results, medical conditions and other factors. Our fixed costs for one freezing cycle is $8,000 and includes: monitoring office visits, pelvic ultrasounds and blood tests during stimulation; anesthesia and egg retrieval by physicians; surgical suite and laboratory fees and egg preparation for cryopreservation. The cost to maintain frozen eggs is $275 per year at our partner clinic, Reprotech, Ltd.
We offer a popular 2 Cycle Package for patients intending to store sufficient eggs to undergo 2 or 3 thaw attempts. By having a generous number of frozen eggs, this option also makes it possible to have sufficient eggs for a second child. Dr. David Diaz, MD, ABOG is the Medical Director of egg freezing at West Coast Fertility. He is one of the country’s foremost authorities on the science and process of egg freezing. His egg freezing success rates have been celebrated at the world’s first ever reunion of frozen egg babies.